I was instantly smitten with this asymmetrical blouse at the thrift store a couple weeks ago. Judging by the seam finishing I'm fairly certain it's homemade. It fit fine in the waist but was too big in the armpits and arms. A quick seam on either side and done. Easy peasy. I like this look, it's so ladylike! And I love how you added the coral belt for color! Coral is such a fun splash of color. Love all the thrifing finds you have! 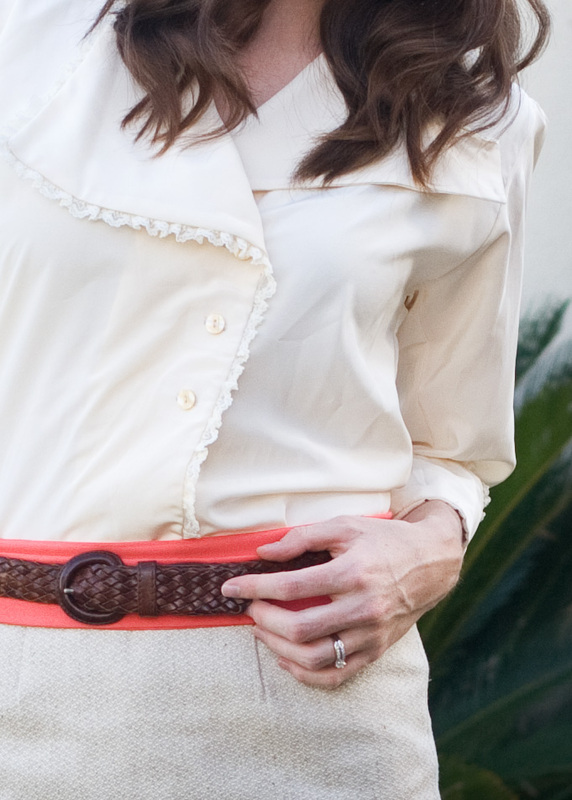 That coral belt is PERFECT! Thanks for featuring Charming Charlie in your blog!! We have added your blog to our blog mentions page on our website. It’s a page we created exclusively for showcasing Charming Charlie blog mentions! Girl you are hot!! Love the hair! Love the outfits! Love the posts. Just had to tell you :) ps miss you and need to come visit and catch up with you soon!